NOVEL featured in Millennium Magazine, MOMA, New York, organised by David Senior and Rachel Morrison, February 20–May 14, 2012. This survey of experimental art and design magazines published since 2000 explores the various ways in which contemporary artists and designers utilize the magazine format as an experimental space for the presentation of artworks and text. Throughout the 20th century, international avant-garde activities in the visual arts and design were often codified first in the informal context of a magazine or journal. 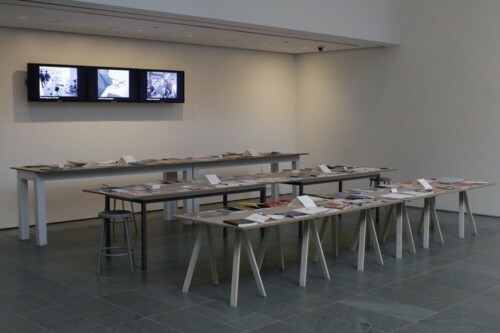 This exhibition, drawn from the holdings of the MoMA Library, follows the practice into the 21st century. The works on view represent a broad array of international titles within this genre, from community-building newspapers to image-only photography magazines to conceptual design projects. 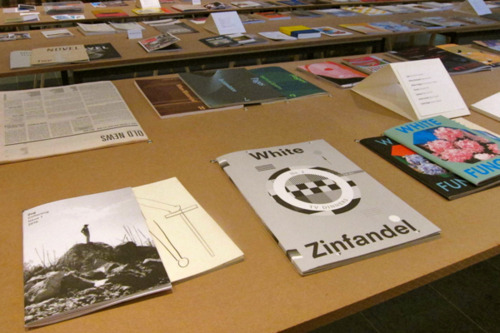 The contents illustrate a diverse range of image-making, editing, design, printing, and distribution practices. There are obvious connections to the past lineage of artists’ magazines and little architecture and design magazines of the 20th century, as well as a clear sense of the application of new techniques of image-editing and printing methods. Assembled together, these contemporary magazines provide a first-hand view into these practices and represents the MoMA Library’s sustained effort to document and collect this medium. ‘Outrageous Fortune’ is a new Hayward Touring exhibition, curated by Andrew Hunt, director of Focal Point Gallery, showcasing contemporary artists’ interpretations of the classic Tarot de Marseille deck of cards. Tarot playing cards originated in Italy in the 15th century. Used in most of Europe to play games, in the English-speaking world the tarot is generally associated with divination and fortune telling. A rich source of imagery, it includes such archetypes as The Fool, The Magician, The High Priestess, The Lovers, The Wheel of Fortune, and The Hanged Man. For this project, seventy-eight artists, whose work encompasses a variety of formal, conceptual, expressionist, literary or design-based approaches, have been asked to create a card for a contemporary tarot pack. Each artist has been drawn a card randomly, and invited to reinterpret in their own way. Among the contributions are The Nine of Swords (signifying rewards due to one’s efforts) by Mike Nelson; The Four of Pentacles (one who is attached to material wealth) by Alan Kane; The Hermit (solitude, the passage of time and a search for virtue) by Suzanne Treister; The King of Wands (leadership and masculine authority) by Dan Rees; The Two of Pentacles (different possibilities) by Adam Chodzko; The King of Chalices (imposing one’s will and interaction) by Cerith Wyn Evans; The Ten of Chalices (attaining one’s goals) by Cullinan Richards; The Four of Chalices (initial success) by Tris Vonna-Michell; The Ace of Chalices (new beginnings) by Anna Barriball; The Magician (taking advantage of others or being taken advantage of) by Melanie Gilligan; Temperance (a balance of character and psychological health) by Simon Davenport; The Knight of Swords (determination and setting boundaries) by Will Holder; The Three of Swords (formulating a strategy and self defence) by Lindsay Seers. The exhibition will consist of the original artworks, all produced to the same near-A3 format, framed and accompanied by explanatory captions, and an example of the original Tarot de Marseille pack. A special numbered edition of 1,000 printed decks of cards will be produced, which will be given away to recipients nominated by the artists. The box will be designed by Scott King and the back of the cards by Susan Hiller, and both these artists’ original work will be included in the exhibition. The exhibition opens at Focal Point Gallery, Southend-on-Sea (4 July to 27 August 2011) and then tours to Queens Hall Arts Centre, Hexham (10 September to 9 October 2011), Jersey Arts Centre, St Helier (24 October to 12 November 2011), mac, Birmingham (10 December 2011 to 8 January 2012), Holden Gallery, Manchester (14 January to 12 February 2012), University of Hertfordshire Galleries (24 February to 21 April 2012) and Bedales Gallery, Petersfield (27 October to 2 December 2012). By and By 2009, International Project Space. 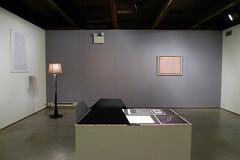 NOVEL at Sculpture Center, New York, a set on Flickr. Josef Strau, “What should one do”, 2011. Mixed media. Dimensions variable. Steven Claydon, “Osmium and Wolfram”, 2008. Wall drawing/print. Dimensions variable. Paul Thek, “Untitled (1 to 1)”, 1982. Acrylic on newspaper. 21.75” x 27.75”. Ed Atkins, “Impulses to Reanimate a Dead Alsatian (collectively)”, 2010. Ink on paper, ferric tape, tape recorder, and silkscreened poster. Dimensions variable. Sergej Jensen, “Untitled”, 2011. Burlap. 30” x 50”. R.H. Quaytman, “Distracting Distance, Chapter 16”, 2010. Oil, silkscreen, and gesso on wood. 24.75” x 40”. Sam Lewitt, “Portfolio (Monograms 2 of 2)”, 2008. 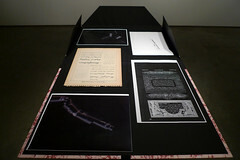 Portfolio with ink and graphite on paper, ink on paper, carbon paper. 4” x 5” negative in plastic sleeve, 3 color photocopies Portfolio: 17” x 22”, plinth: 34” x 35” x 22”. Marc Camille Chaimowicz, “Shoe Waste?”, 1971/2005. 5 hand-printed silver gelatin prints. 9.8” x 15.9”, 8.5” x 15.9”, 11.7” x 14.4”, 15.9” x 10.8”, 15.7” x 9.3”. 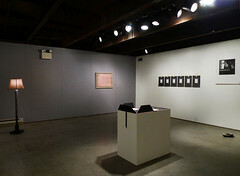 Novel at Sculpture Center on Flickr. NOVEL draws together artists writing, texts and poetry that oscillates between modes of fiction and criticism. The printed pages coalesce as an apparatus for knowledge capture, informed by theory, film, politics and storytelling; writing as parallel practice; writing as political fiction; writing as another adventure, renegotiating unfulfilled beginnings or incomplete projects – that might offer an alternative script. Each iteration of NOVEL is distributed through the fictioning of a scenario that includes the staging of exhibitions, readings and screenings. Here, that scenario takes the form of NOVEL revisiting past collaborations with Ed Atkins, Marc Camille Chaimowicz, Sergej Jensen, Sam Lewitt, R.H. Quaytman, Josef Strau and Paul Thek. Within the exhibition, archival and historical settings are re-animated only to be undone, including William E. Jones’s video Berlin Flash Frames, 2010, which parcels out footage from an unedited film produced by the U.S. Information Agency found in the National Archives of the United States labeled with the provisional title “Berlin, 1961″. Jones’s re-edit features distanced shots of the Berlin Wall under construction alongside propagandistic scenarios featuring actors on stage sets. Similarly, Emily Roysdon’s Untitled (David Wojnarowicz Project), 2001-2007, responds to and redirects Wojnarowicz’s earlier work Arthur Rimbaud in New York, 1978-79, while an excerpt from Marc Camille Chaimowicz’s Shoe Waste?, 1971-2005, returns to documentation of a clandestine action performed above and beneath the River Thames in London. Additional works to be exhibited include a new sculpture by Rachel Harrison, Avatar, 2010; Ull Hohn’s series of plaster relief paintings, Untitled, 1988; Thea Djordjadze’s Deaf and dumb universe (Gerüst), 2008; and Troy Brauntuch’s Stamps, 1975-2007, which gathers together the artist’s collection of figurative rubber stamps that have been used in his collages over the past thirty years. Also on view will be sculpture, collage, and video works from Rosemarie Trockel, including Goodbye Mrs. Mönipaer, 2003, a cinematic pantomime that explores the psychologically fraught role-playing that can emerge between artists and gallerists, studio and market concerns, and private and public selves. The performing body and political subject present themselves throughout the exhibition via acts of estrangement, reversal, ritualized behavior, and fragmentation. Manon de Boer’s film Attica, 2008, for example, captures a refracted consideration of the 1971 prison uprising in the form of a musical performance, while Rosalind Nashashibi’s This Quality, 2010, offers an indirect view of Cairo through tightly framed observations of likeness and variation. Matthew Buckingham’s Image of Absalon to be Projected Until It Vanishes, 2001, addresses a public that may no longer exist in a fragmented portrait of the Danish warrior-bishop and quasi-mythic founder of the city of Copenhagen. Similarly, the place of abstraction reasserts a longstanding dialog with the place of iconography through modes of projection, superimposition, doubling, and associative image sequences in works by Richard Aldrich, Moyra Davey, Charline von Heyl, Elad Lassry, and Blinky Palermo. Also included within Time Again is a presentation of works organized in collaboration with Novel, a project founded by London-based editors and curators Matt Williams and Alun Rowlands. A publication project that takes up experimental writing as a parallel practice to visual art making, Novel draws on politics, poetry, theory, and storytelling to promote explorations of language and the possibility of a new critical fiction. Extending across artistic mediums into sculpture, film and video, photography and painting, Time Again provokes a consideration of how ‘the now?’ of our time is perceived. A series of talks and performances will take place at SculptureCenter, and a related screening series will be presented in collaboration with Anthology Film Archives. The exhibition catalog will feature texts by contributing artists—including Ed Atkins, Josef Strau, and Richard Aldrich—and essays by Fionn Meade, Jacob King, and Isla Leaver-Yap.